After the short winter days everybody is looking forward to the warm rays of sunlight. In March and April the conditions in Jerzens in the Pitztal valley are perfect for spring skiing, attracting leisure skiers and nature lovers. The patios of the restaurants and mountain huts in the ski area Hochzeiger invite to take a lazy break in the sun. At an altitude of 1,500 metres above sea level, the sunny high plateau of Jerzens is ideal for winter sports at this time of the year. Skiing & freeride area Pitztal Glacier & Rifflsee: only 30 minutes from Jerzens. High-altitude skiing on elevations up to 3,440 metres. The free shuttle bus takes you to the valley station and back to Jerzens. Skiing holidays at Hotel Andy are perfect for those who want to be the first on the pistes. The hotel is located directly at the valley station of the ski area Hochzeiger. After a sumptuous breakfast just put on your skis and head up the mountain. The Hochzeiger ski region boasts 54 kilometres of perfectly groomed pistes of all levels of difficulty. 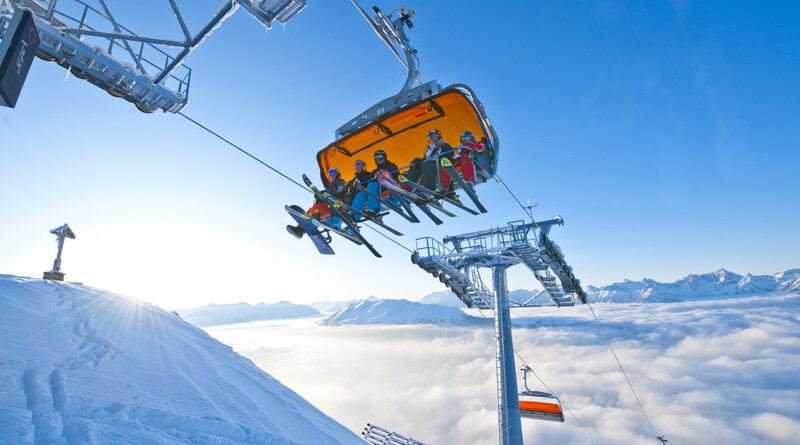 9 comfortable top-modern lifts take you up the mountains up to 2,500 metres above sea level. The ski area offers steep descents, mogul pistes, wide slopes and the snowpark Hochzeiger for boarders and freestylers. Snow conditions are perfect until the end of April. There’s just as much fun off the slopes. How about tobogganing on the 6-kilometre toboggan run which is illuminated at night, or a leisurely winter hike? There’s lots of outdoor activities for nature lovers off the ski pistes. Ready for a break? The Hochzeiger ski region is perfect to enjoy local culinary traditions. The Zeiger restaurant, Tanzalm-Jerzner Alm, Hochzeigerhaus and the Stalder Hütte offer an exquisite and varied cuisine which meets the highest culinary standards. The hotel’s own “Egger-Lounge” is located just opposite Hotel Andy. Traditional and stylish at the same time, it’s the hot spot for all après ski fans. Skiing holidays at Hotel Andy stand for enjoyment of the great outdoors combined with the amenities of a family-run 4* superior hotel. The perfect choice for nature lovers, winter sport enthusiasts and connoisseurs. Indulge in rest and relaxation in our spa, let us treat you to culinary delights paired with the finest wines from our well-stocked cellars. Enjoy the finer things in life!